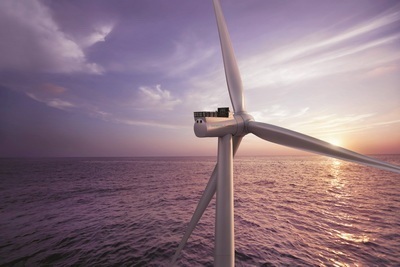 Siemens Gamesa Renewable Energy (SGRE) was named preferred supplier today by customer Ørsted for their 900 MW Greater Changhua offshore wind power projects in Taiwan. The project includes approx. 112 units of the Asia-Pacific variant of the SG 8.0-167 DD offshore wind turbine and a Service agreement. Subject to the agreement becoming a final contract, Siemens Gamesa will establish a nacelle assembly facility near Taichung Harbor. The facility is expected to be ready by 2021, ahead of the local content creation timeline as set by the Taiwanese government. Wind turbine towers for the projects will be supplied locally through the partnership between CS Wind and Chin Fong in Taiwan, meeting the official requirements for local content on wind turbine components. Offshore construction for the projects to begin in 2021. “We are proud that Ørsted has selected us as the preferred supplier for these important projects in Taiwan, and look forward to it becoming a confirmed order according to the current plans. Greater Changhua represents an extremely significant leap forward for SGRE in Taiwan. 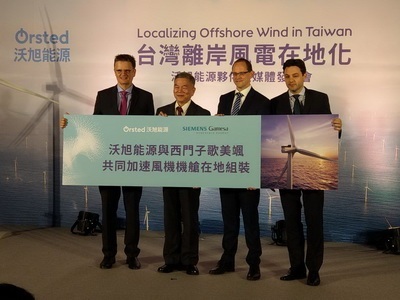 It will enable us to establish a nacelle assembly facility in Taichung Harbor by 2021 upon Ørsted’s request, and ahead of local content requirements as set by the Taiwanese government,” says Andreas Nauen, CEO of the Offshore Business Unit in Siemens Gamesa Renewable Energy. The SG 8.0-167 DD offshore wind turbine variant for Asia-Pacific markets addresses local conditions across the region. It ensures that the SG 8.0-167 DD is tailored to meet local codes and standards regarding typhoons, seismic activities, 60 Hertz operation, as well as operation in high and low ambient temperatures. It has a rated capacity of 8.0 megawatts (MW), and a rotor with a 167-meter diameter. It has a swept area of 21,900 m2, and utilizes the SGRE B81 blades, each measuring 81.4 meters. By 2020, more than 1,000 SGRE Direct Drive offshore wind turbines will be installed globally. “Securing this preferred supplier agreement with Ørsted proves that our technology and business commitment fit extremely well with the Taiwanese offshore wind industry and the government’s commendable plans. We’re creating workplaces in the short-, medium-, and long-term, and contributing to the positive growth story of renewable energy in the market,” says Niels Steenberg, Executive General Manager of Siemens Gamesa Offshore for Asia-Pacific. In September 2018, the first SG 8.0 167 DD prototype was installed and commissioned according to plan in Østerild, Denmark. Since being introduced seven years ago in 2011, the Siemens Gamesa Offshore Direct Drive wind turbine platform has accumulated the equivalent of 450 years combined operation. This 12.5 TWh of power generation is equal to the energy used by all households in Taiwan for three months. Siemens Gamesa is a global leader in the wind power industry, with a strong presence in all facets of the wind business: offshore (#1), onshore (#2) and services (#2). In 2017, the company placed first on the turbine OEM ranking compiled by Make Consultancy with a market share of over 17%. Through its advanced digital capabilities, the company offers one of the broadest product portfolios in the industry as well as industry-leading service solutions, helping to make clean energy more affordable and reliable. With 87 GW installed worldwide, Siemens Gamesa manufactures, installs and maintains wind turbines in the onshore and offshore segments. Its order backlog stands at €23 billion. The company is headquartered in Spain and listed on the Spanish stock exchange (traded in the Ibex-35 index).